Option 1) Hire developer and ask him to develop website. The cost will be ranged from 1000 USD to 3000 USD (I got this price ranged from Freelancer.com quotation). Option 2) You can purchase readymade php scripts which have similar features to nametests. Last year, I was firstly exposed to that kind of viral quizzes websites. 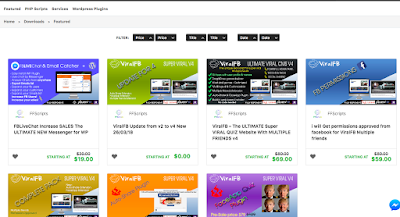 I also wanted to own one website like this as it can generate revenue. So I searched over internet on How do I make website like name test. Luckily on codecanyon, I found the script named ViralFB. At that time, its’ price is not too pricy, just around 24 USD which included 6 months support. So I purchased and hosted the script on GoDaddy shared hosting. At that time, the script was in early stage, didn’t have multiple friends features. It was easy to set up and host this script on server. You don’t need to know about coding, but you need to know how to create database on server. (Don’t worry, script is accompanying detailed installing guide). And if you still face a problem after following installing guide, their support to customers is really great and helpful. But now the price goes up and you can purchase ViralFB script with basic features at Codecanyon and which will be costed around 80 USD. But if you buy directly from their website, you will get multiple friends plugin and will be costed around 110 USD. Personally I like this script than any other scripts as it is very user-friendly. It can filter gender. And have better CPM result. The weakness is that it can only crate random result and you cannot create quiz like socioquiz. I will not going to explain set up process in this article. You can see set up procedure in their respected websites.